During our Swampchat discussion of June’s Movie of the Month, the Brian De Palma political thriller Blow Out, I pointed out that “Blow Out is in some ways a movie about making movies, but more specifically it’s a movie about how essential sound is to film. It boils the medium down to one of its more intangible elements. In that way it’s much more unique than a lot of other movies about movies, arriving more than three decades before the film it most closely resembles in this approach (that I can recall, anyway), Peter Strickland’s Berberian Sound Studio.” The entire time I was watching Blow Out I was aching to revisit Peter Strickland’s oddly engaging Berberian Sound Studio to see how the two films compare. It turns out that while Blow Out distills the process of making movies into a single element, recording sound, Berberian Sound Studio breaks it down even further until there is nothing left. De Palma used sound recording as an anchoring element for a story that had great impact outside the world of film-making, a world tainted by serial murders & political intrigue. Strickland’s film, on the other hand, rarely allowed the audience to leave the recording booth & gets lost in its own sound-obsession. Although they are working within separate genres with their own respective aims & are separated by three decades of film-making, it’s not at all difficult to draw a connection between the two works. First of all, they’re connected by their basic movie-within-a-movie structure. In Blow Out, Travolta’s sound technician protagonist is working on a cheap slasher film for which he cannot find an actress with the perfect scream to match a brutal shower stabbing. When asked if he ever works on good films, Travolta responds “No, just bad ones.” The befuddled sound technician in Berberian (expertly played by character actor Tobey Jones), on the other hand, is hired for an Itallian giallo film called The Equestrian Vortex that also gradually proves itself to be a tawdry, violent horror film (although the director insists they’re making art). We’ve explored the giallo lineage of slasher films before in our discussions of former Movie of the Month Blood & Black Lace, but the connection is rarely as clear as it is in the comparison here. While Travolta is looking for a single scream to accompany his cheap slasher movie (when he’s not investigating assassinations in his free time), Berberian Sound Studio depicts countless micro-searches for the exact same thing. The exact sound of a neck being sliced or a witch’s hair being yanked from the scalp or even the standard damsel’s death rattle are all meticulously sought after here. Berberian depicts a wizardly crew of demented Gallaghers smashing melons, pulling turnip roots, and tormenting actresses to capture the perfect sounds for what amounts to a slightly artier version of the trash that Travolta’s is mindlessly cranking out in Blow Out. However, as stated, the films do have disparate aims for their respective sound obsessions. Blow Out uses sound as a doorway to a world outside the recording booth. It’s a dangerous world, but it’s an exterior one where big, important things are happening. Berberian Sound Studio, in contrast, becomes psychedelically insular. It not only gets lost in the recording booth, but also in the idea of sound itself. There’s so much horror & dissociation in the sound techniques employed in the film that it reaches an otherworldly state of mind that mimics the broken psyche of Bergman’s Persona just as much as anything it echoes from De Palma’s film. When you watch Berberian on Netflix with the closed captions enabled, the screen is filled with ludicrously long lists of sound descriptions desperately trying to keep up with every aural element in play. Early in the film a character ominously warns/promises, “A new world of sound awaits you. A world that requires all your magic powers.” It’s doubtful that the protagonist or most of the audience took him as literally as he meant it, but Berberian really is a lot more interested in the magic of sound than the more technically-minded Blow Out. If I had to boil down the difference between the two films, I’d simply point out that Travolta’s protagonist spends most of his run time trying to piece together a crime scene & to capture a maniac killer, while Jones’ character is trying to get reimbursed for an airline ticket & to hold onto his basic sanity. De Palma’s approach weaponized sound to strengthen his political thriller’s arsenal. For Strickland, sound wasn’t a powerful tool; it was the entire point. The movies do share an impressive amount of overlap, though, especially in Blow Out’s early, growling winds & in both film’s audiophile obsession with analog equipment. It’s difficult to imagine either film could be set in 2015 without being changed drastically. It’s doubtful that either film would mean much of anything once digital equipment removed a lot of the incidental sound from recording booths. 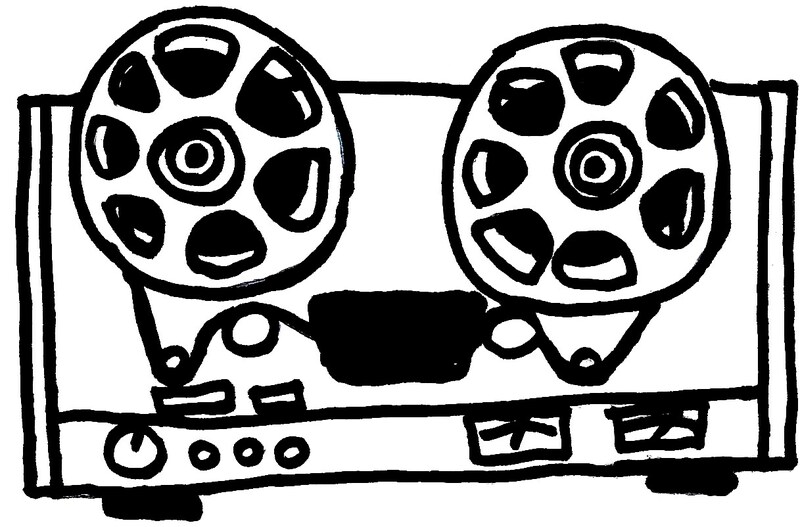 The clacking & whirring of film projectors and tape recorders are essentially the two films’ lifeblood. Even the sound of the instruments that capture & display images are essential to cinema in these two films’ worldview. That’s the kind of synesthesia we’re working with here: there’s a sound even to the imagery. Blow Out just happens to use this attention to sound to open a door, while Berberian chooses to lock itself in the dark & swallow the key. They’re both overwhelmingly successful in their respective endeavors. For more on June’s Movie of the Month, 1981’s Blow Out, visit last week’s Swampchat on the film.